Carnival is the name of the season and Mardi Gras is just one day. “Mardi Gras” is the last Tuesday before Ash Wednesday and “Carnival” is the season that begins on the Feast of Epiphany. 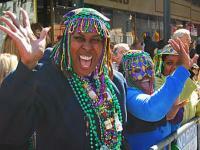 A krewe (pronounced as crew) is an organisation or group that puts on a parade or a ball for the Carnival season. It's unlikely you'll have your own dog with you if you've flown to New Orleans but if you're a dog lover you'll love seeing some of the dogs in their Mardi Gras costumes! The dogs also have their very own parade in New Orleans with the Krewe of Barkus. Mardi Gras is also for families too as you can watch parades with locals at family parade-watching spots including Charles and Napoleon and St. Charles at 3rd or 4th conveniently close Garden District lodging. They always make sure there's extra goodies for the kids! Shouting at the floats, waving your hands in the air will definitely get you goodies or you can put your children on your shoulders, but if you really want to test your suitcases weight limit you should head to the end of the parade as you’ll be showered with gifts from the floats as their goal is to chuck all bags of beads before they get off the float themselves! Bathroom humour never seems to grow old as evidenced by the Krewe of Tucks in their giant toilet bowl float! As the screaming crowds line the street begging for their bathroom-themed throws, which have previously included monogrammed toilet paper, sunglasses shaped like toilets, mini-plungers and more. In Shreveport, the Krewe of Highland is very popular, who throw Spam and hot dogs. Most people will come home with beads but if you can get miniature squirting toilets and dinner too that's got to be a bonus! As stories say, the reason for the bead throwing started in the 1880s with a man dressed like Santa who received such fame throwing beads that after that other krewes followed suit. Nowadays krewes buy plastic beads en masse which parade-goers love! Occasionally people will still see throws of tiny glass bead strands but these are rare and started being phased out in the 1960s and 1970s. Beware of heavy suitcases though! Officials estimate upwards of 25-million pounds of Mardi Gras items get thrown from floats, with more than half of which winds up on New Orleans streets but locals like to visit ARC of New Orleans to recycle their beads for the following year. Despite the fact that it is just one big party Mardi Gras is actually a legal holiday in Louisiana, and has been since 1875, when Governor Warmoth signed the “Mardi Gras Act". So you'll definitely get to spend time with the locals. Mardi Gras Isn’t Just in New Orleans though. You can get your Mardi Gras groove on at the Cajun Mardi Gras in Lafayette or dance away at a Baton Rouge Mardi Gras ball....or head to Mobile in Alabama where it all started. You can also check out the Mardi Gras Museum of Imperial Calcasieu in Lake Charles or the particularly family-friendly Mardi Gras in Alexandria. Mardi Gras is also celebrated all over the world including many locations in Europe and also you'll find massive celebrations in Brazil every year! Read more about Mardi Gras or view the 2019 Mardi Gras Parade Schedules. If you want us to send you further information just email louisiana@deep-south-usa.com.